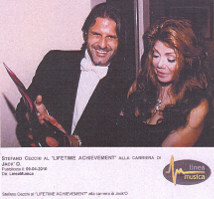 Los Angeles has chosen Italy’s Stefano Cecchi to award the international “LIFETIME ACHIEVEMENT” to the career of Jack’O. The numbers are in favour of that which the official invite defines “child prodigy”. Defined as “The King of Compilation”, with the homonymous label, Stefano Cecchi Records, he has signed over 700 artists, published around 80 records and 9 co-productions with the Buddha Bar.